The problem addressed in the current study was that disruptive student behavior is detrimental to learning because quality teacher-student interaction time is reduced. 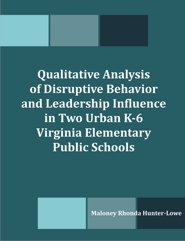 The purpose of this ethnographic research study was to explore relationship between disruptive behavior of students and leadership styles of teachers, parents and school leaders. Results indicated that in some cases, an individualized approach could help the K-6 elementary student by reducing their disruptive behavior. However, it was also confirmed that as part of this individualized approach, school-wide implementation might provide the level of support needed to prevent future disruptive behavioral problems as well as providing the positive role models for students to observe and emulate. Dr. Maloney Rhonda Hunter-Lowe earned an Associate degree in Business (A.s), a Bachelor in Psychology (B.S), a Master in Elementary Education (M.S) and a Master in School Administration (M.S) all from Mercy College in Dobbs Ferry New York. She completed her Doctoral Degree at the University of Phoenix Online in Educational Leadership (Ed.D). Dr. Hunter-Lowe is a fifth grade teacher in Portsmouth, Virginia.